Casting defect (often referred to hot crack) that might occur if a residue of liquid phase is still present in a largely solidified cast body. Consequently, they emerge at high temperatures and accordingly, their surfaces are mostly oxidized. Formation of warm cracks takes place prior to the metal reaching its solidus temperature. In case of insufficient post-feeding of solidifying melt, e.g. cue to risers dimensioned too small, warm crack formation commences at a higher temperature level during the solidification interval; however, if sufficient seal feeding is ensured, hot cracking only takes place shortly before reaching the solidus temperature. 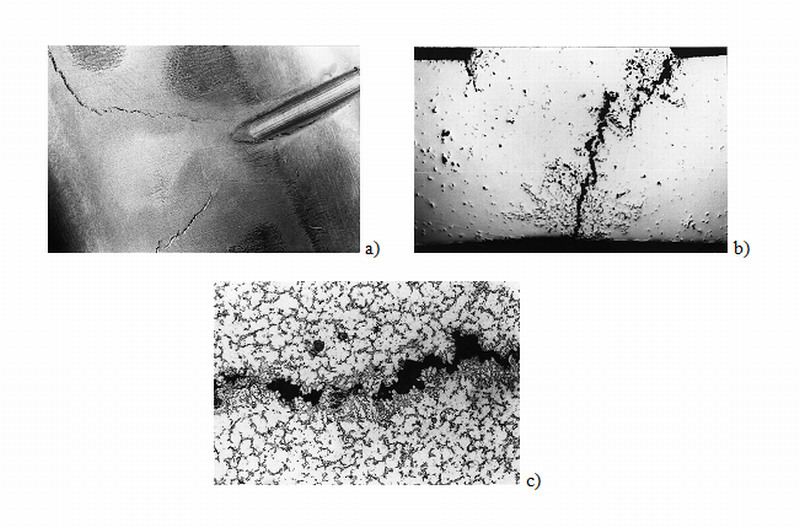 Moreover, hot cracks are intercrystalline in contrast to cold cracks or stress cracks(Figures 1 to 3). The physical cause for hot crack formation is contraction in volume (see shrinkage) of the most metallic materials during solidification and cooling. If this contraction is prevented due to friction between the casting metal and th mold or through protruding parts of a casting body, or maybe faster solidification of thinner cross sections, there is generally a risk of hot ckracking. Materials that are most prone to hot cracking are predominantly those alloys with relatively large solidification intervals or containing additives that form phases with lower melting points and thus practically extending the region of coherent condition into the area below the actual solidus temperature. As a general rule it can be stated that those alloys with large temperature intervals for solidification and initially high crystallization rates are the most susceptible to hot cracking. Compared to that, materials that are most insensitive to hot cracking are alloys in which an ample amount of eutectic melt (i.e. melt solidifying at a consistent temperature) is still present towards the end of solidification since no contraction and consequently no stresses occur at consistent temperatures. 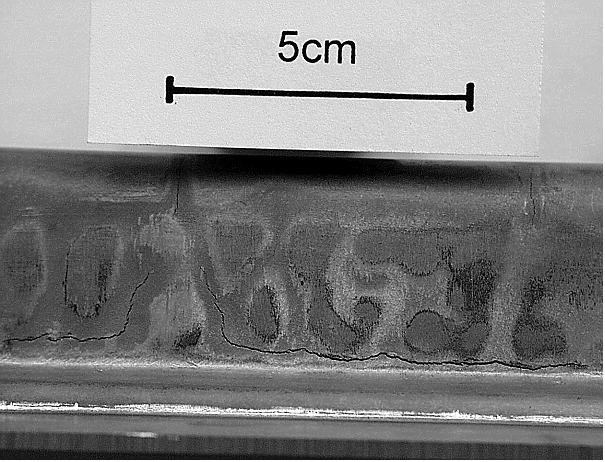 The shape-changing process of the individual casting sections has reached such a status that dendrites that are locally separated by a molten layer move apart in relation to one another. Constant feed of melt prevents formation of cracks or incipient cracks may be filled if re-flow of residual melt into the material separation area is ensured. In addition to the morphology of the solidification front, the feeding capacity of a casting material plays a vital role. The primary crack may grow even further due to notch effect and concentration of stresses, even into the region below the solidus temperature. 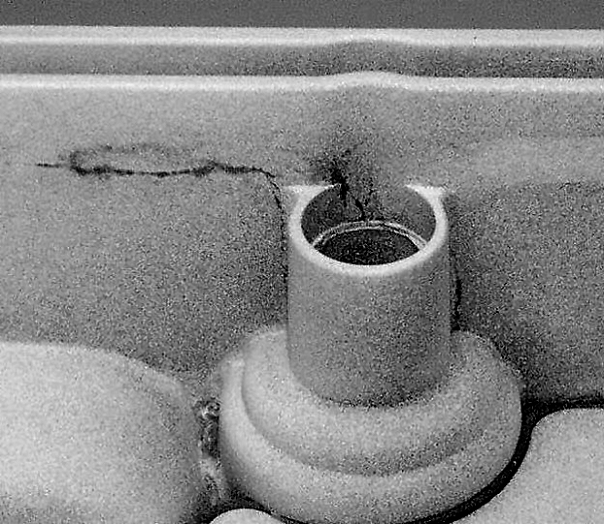 It goes without saying, that refilled cracks bear the risk of cracking again (secondary cracking) because the reflowing residual melt may provide poor strength characteristics due to segregation and possible impurities. With regard to the types of solidification, increasing hot cracking tendency can be assumed in the following order: exogenic smooth-wall - exogenic rough-wall - endogenic shell forming - endogenic mushy - exogenic spongy. Interdependencies and effects of feeding capacity of the alloys are also involved in the processes and structures of solidification. With iron-carbon alloys, steel and melleable cast iron are far more prone to hot cracking than gray solidified cast iron alloys. The maximum tendency for warm cracking is expected for cast steel with approx. 0.4 % carbon content; a relatively low tendency is found for contents below 0.2 %. Sulfur and phosphorous have a particularly negative influence on the residual melt. Manganese is capable of compensating the detrimental effects of sulfur. The tendency towards warm cracking increases proportionally with the rate of molding material expansion (see Sand expansion). It is increased with decreasing heat diffusion capacity of the molding material. It is increased with and increase in the casting temperature and the oxygen content in the melt.